Eating disorders, bulimia nervosa and anorexia nervosa are becoming more and more common throughout the West. Anorexia Nervosa and Bulimia Nervosa have existed for a very long time. In the UK alone about one woman in every hundred suffers from bulimia nervosa and only slightly less have anorexia nervosa. Eating disorder affects women and girls of all ages and sometimes men. It is not only young women who suffer from eating disorders; men and women of all ages are affected. 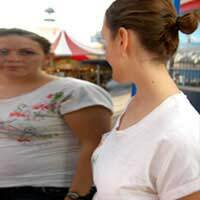 Anorexia nervosa is a serious disorder which can become life-threatening. It occurs when a person refuses to maintain a healthy body weight. Other symptoms of this disorder include a distorted body image, an intense fear of gaining weight, and amenorrhea. Anorexics will starve themselves, some of them will engage in binging and purging cycles. Serious medical complications such as starvation, chronic weight loss and death can result. Studies show that anorexics harbour negative feelings about their bodies that are morbid and irrational. Bulimia nervosa is a disorder which totally disrupts sufferers' eating patterns. A person with bulimia nervosa has an abnormal relationship to food which means that they can no longer eat regular meals but go through cycles of binging and the purging. Bulimics with often have a food binge than after will panic about the quantity of food they have eaten and will want to rid themselves of it. Typically they will do this by using laxative or making themselves vomit, or sometimes a combination of the two. Other bulimics may have a period of fasting after a binge, instead of inducing vomiting. Anorexia nervosa - Anorexia can reduce the heart rate and cause blood pressure to drop, which increases the risk of heart failure. It can also cause the hair to dry out and become thin and brittle, fingernails and teeth may become discoloured. In severe cases sufferers develop a fine down of hair all over the body, this is called lanugo. Bulimia nervosa - The acid in vomit can eventually begin to dissolve the enamel layer of the teeth, inflame and damage the oesophagus, and inflame the glands near the cheeks. The stomach lining may also become damaged due to frequent vomiting. Peptic ulcers, pancreatitis and chronic constipation may also be brought on through bulimia. There are a range of effective treatments for eating disorders throughout the UK. Newer treatment programs use the techniques and talents of a broad spectrum of health experts. There are a number of in-patient programs which are designed to suit individual needs. Programmes aim at restoring total physical, mental and emotional health.